Would you like to record calls ? 'Red Call Recorder 1.1' is an easy-to-use tool with perfect solution for Record and save many hours of phone calls - with just a click of your mouse. When accepting a call, Red Call Recorder 1.1 will immediately recognize the caller, than one mouse click on 'Record' will start recording the call to a common compressed wave file (up to 1.1KBps - less then 4MB for an hour!). You can pause or continue recording, and all in real time. Just operate the dialer, type the desired number, and press" create recorded call". When connected to the desired number, the program will present a message "start recording outgoing call" press "ok" , this call will now be recorded. You can play the call while it is being recorded. Speakers or earphones can be attached and a third party can also listen to the call while recording is taking place. Windows 98 SE, ME, 2000, XP or above. Visual Basic 6 Runtime file (For Windows 98). Adding remarks, flags and priority for each call. Display and voice while a call is incoming. Controls the call- allows total control over an incoming call. Save messages into common wave formats. Compressing hours of recorded calls on a minimum of disk space (up to 1.1 KBps). Caller ID- Tapi or Comm based. Presents the call on display, including caller name and caller number. Dialer - makes the outgoing call, directly from your PC. Advanced and user-friendly graphic interface. Registration log for all calls and events. records telephone conversations to your computer's hard disk. is a phone recording software with Caller ID and convenient call logging, records telephone calls and conversations directly to your hard disk with a single push of button, optionally playing a legal disclaimer. is Internet phone for Mac OS X using VoIP to provide crystal clear voice quality..
is a Caller ID detection software that will Turn your PC into advanced Caller ID device using your modem or ISDN device. is an industrial strength, reliable call accounting software package for monitoring and reporting telephone call activity. 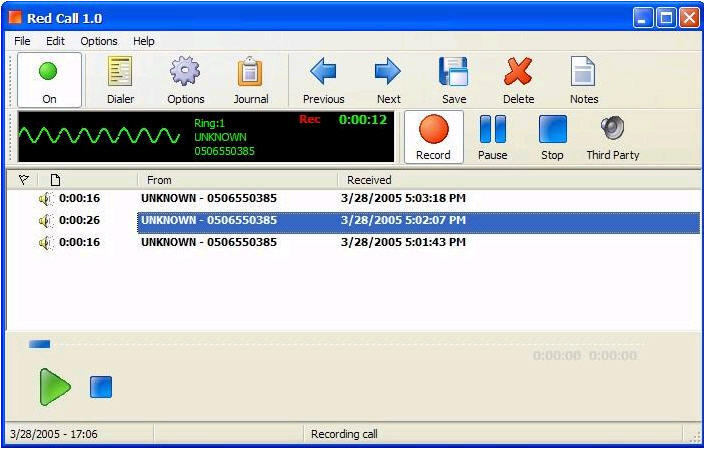 TRx is a phone call recording program for Windows, Mac OS X and Windows CE devices.